Earlier, the White House criticised the arrival of Russian military aircraft in Caracas, with Vice President Mike Pence calling it an "unwelcome provocation". US President Donald Trump, in turn, demanded that Russia "get out" of Venezuela, while at the same time did not exclude the use of military force by the US in the country. US Special Representative for Venezuela Elliott Abrams announced on 29 March that Secretary of State Mike Pompeo would soon come up with a response to last week's arrival of Russian military planes in Venezuela. "We have a very nice options paper of the various things that can be done in US-Russia relations. There are a lot of things we can do in economic terms, in terms of sanctions. There is a lot of things that are on the list. So, The Russians will pay a price for this", he said. In turn, the US president's National Security Advisor John Bolton has warned countries "external to the Western Hemisphere" against deploying military forces in Venezuela or "elsewhere in the Hemisphere" in a statement made on 29 March. He further underscored that the US would consider such military deployments to be provocations and "a direct threat to international peace and security in the region". "We strongly caution actors external to the Western Hemisphere against deploying military assets to Venezuela, or elsewhere in the Hemisphere, with the intent of establishing or expanding military operations", he said. He also accused Venezuela's President Nicolas Maduro of trying to remain in power by using "Russian military personnel and equipment". Bolton further said that the US vows to continue protecting its interests in the Western Hemisphere. Venezuelan Foreign Minister Jorge Arreaza suggested that Bolton should focus in his actual responsibilities, namely "ensuring US security", and not spend his time trying to intervene in Venezuela's "domestic matters". The US State Department in a statement suggested that the Russian military planes that arrived in Venezuela had brought specialists tasked with restoring the S-300 air defence systems to operation after several blackouts hit the country in March. "One of the things they are doing seems to be, and we thought this from the very beginning, helping the regime with the S-300 ground-to-air missile system, which apparently got all screwed up by the blackout", he said. Caracas' military attaché in Moscow, Jose Rafael Torrealba Perez, earlier stressed that Russian specialists, who recently arrived in Venezuela, had come there to discuss defence industry cooperation between the two states and not to conduct any sort of military operations. Russian presidential aide Yuri Ushakov advised the US against worrying about Russian planes in Venezuela, as their arrival had been "done within the framework of normal relations with the legitimate government". The Russian Foreign Ministry in turn noted that Russia had not violated either international or Venezuelan law with its actions and that it did not "change the balance of forces in the region". The ministry's spokeswoman also added that as opposed to Washington, Russia has never threatened anyone in the region. 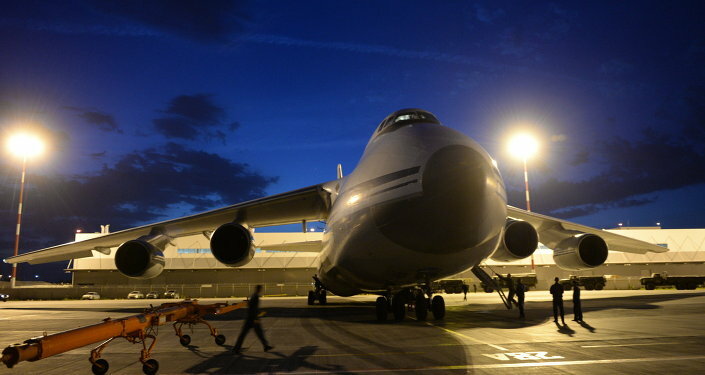 The arrival of Russian An-124 and Il-62 military aircraft on 23 March drew harsh criticism from the US. Vice President Mike Pence called it an "unwelcome provocation", while US President Donald Trump demanded that Russia "get out" of Venezuela and said that all options were on the table to force Moscow to do so. The US earlier recognised self-proclaimed interim Venezuelan President Juan Guaido, with many of its allies following suit. However, a number of other countries, including Russia, China and US NATO ally Turkey, refused to recognise Guaido and instead reaffirmed their support for the legitimate president, Nicolas Maduro. Both Caracas and Moscow have slammed US actions as attempts to forcibly change the government in Venezuela.